Did you know that the premise behind estate jewelry is being green? It is. Think about it. It’s all about recycle, reuse and renew. I’m going to explain how you can do all of the above with your estate jewelry and come out ahead of the game with either a new piece of jewelry or cash in your pocket, but either way, you are going green, recycling and helping the environment. The best way to recycle your estate jewelry or your jewelry that you don’t wear anymore is to sell your item and take the money and reinvest it into another piece of jewelry for yourself and your history. When you recycle this way, reinvest in yourself so that you feel good about what you are doing. Selling estate jewelry is almost like having found money, which is money that is meant to be enjoyed. Reusing an item is all about re-purposing it for something else. Whether you change out the stones, take the entire piece apart and melt the metal and just reuse the stones, you are taking pieces of that jewelry to make something new out of it. This takes vision and talent, but if you are determined to keep your jewelry, and have a bit of money that you want to spend to reuse it, then this is a great way to go. What’s important here is to find a good designer who is capable of doing the design work for you. Calla Gold Jewelry wrote a very nice article about her business model, which focuses around just that. Renewing a piece of jewelry is very similar to reusing it, but you aren’t taking pieces of the ring or necklace that you don’t want and scrapping the rest, you are taking the whole and replacing a small part. 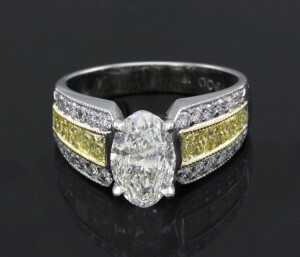 A great example is this ring that we recently got. It is a beautiful designer piece, but the center stone wasn’t that great. It has been renewed with a fabulous oval center diamond and is now being reused as an engagement ring. Recycle, reuse and renew. When you go estate, you won’t ever want to go back because there are so many things you can do with the pieces that you have. What’s in your jewelry box that you can recycle, reuse and renew? *This particular ring is one of our green creations because it is a famous setting that was purchased at a close out and was going to go for scrap. It was fallen in love with and the perfect diamond was paired with it to make it recycled, reused and renewed into a gorgeous one of a kind designer piece that our bride to be will enjoy for years to come!